In my area there is a flower festival in August. I usually visit it. It is a popular event and a lot of people visit the festival. I had some photos on my phone, but I lost them when my phone broke down. I found a few photos on my laptop, and I wanted to show you one of them. I am not sure which year it is from. The flower festival is more than 20 years old and every year they choose a new theme. Some of the previous themes have been recycling, circus and castles. In 2019 the theme will be time travel and it will be interesting to see how they interpret that theme. 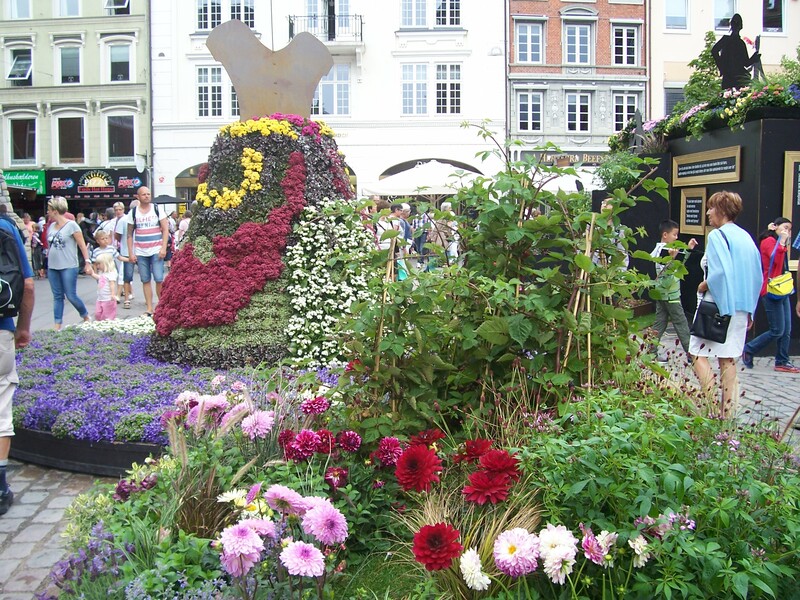 Did you ever visit a flower festival? Yes, I like to visit flower festivals, the past week there was the Camellias festival in Locarno, it's not far from here. That sounds interesting. I am happy that there is a flower festival on my island. In the area where I lived before they didn't have that kind of festivals. I look forward to visiting the festival in August. @Porcospino In the south of France they had the "lemon festival", they build statues and compositions using local lemons, it was beautiful. @LadyDuck I would like to see that. It sounds interesting. We have a cherry festival in my area, but I have never seen a lemon festival. Have not been for some times.Yes I loved to go to them. I also love to visit them. It is interesting that they have a new theme every year, and some of the decorations are amazing. I can imagine.Yes theme are a must do you get your attention there. It is a pity they don't exist in your area. I love flowers, too, and I always visit this festival if I can. It is not that far from my home. We also have a flower festival where they stick to one kind of flower. It is called the rose festival. I have only seen it a few times, but I would love to visit it again. I have not but I imagine they can be very fun to attend. You will have to share the pictures of the time-travel theme when it comes around. Yes, I will definitely bring my camera when I visit the festival in August. It is always fun to see the different decorations. I wonder what the time travel decorations are going to look like. @Porcospino I was wondering if they would shape flowers and plants in the form of a tardis (Doctor Who) or a Delorean (Back TO The Future). @ScribbledAdNauseum That would be interesting. It could also be interesting to include a movie like The Butterfly Effect. I thought I had already responded to this post. Yes we have similar things here. I like the flowers. It should be interesting to see how they depict time travel. I think it is interesting that they choose a new theme every year. I look forward to the next festival in August. Yes, it will be interesting to see how the time travel theme is going to turn out. There are usually a lot people, but I hope that I will be able to take some photos. @Porcospino The Chelsea flower show in London will be on at the end of May. There are some wonderful displays of plants and flowers there. @Gillygirl That sounds interesting. I haven't been to London for years. My husband and I want to visit the UK together one day. He has never been there. I usually visit the flower festival on my island. It takes places in August every year. It is a popular event and lots of people usually show up. @simone10 Yes, it is very beautiful. There is a new theme every year, and it is always interesting to see what they have chosen. Free food festival sounds interesting. What kind of food is it? I have visited an international food festival in my country, but we didn't buy much, because most things were expensive. I hope you will get the chance to visit one in the future. We usually visit our local flower festival every year, and we always to look forward to seeing the new exhibitions and decorations. No, we don't have it here. But I am sure I would like it. We usually visit it every year in August. We plan on going this year as well. I can imagine how lost you must have been going for those shows I would. It is amazing to visit them. I enjoy it a lot. It takes place in August every year, and it is a popular event so the place is usually crowded, but it is worth it. I look forward to visiting the next one. I have never visited a flower festival, but we do have the Morten Arboretum here that has lovely flowers for us to enjoy year round. That sounds like a nice place to visit. There was an arboretum in one of the cities where I lived in the past. I often visited that place. I do love flowers but have never visited a festival. I also love flowers. That is one of the reasons why I really enjoyed my visits to the flower festival. I plan on visiting the festival this year as well. I have not visited a flower festival, but I do enjoy the flowers in the parks here. I have never gone to an actual flower festival.